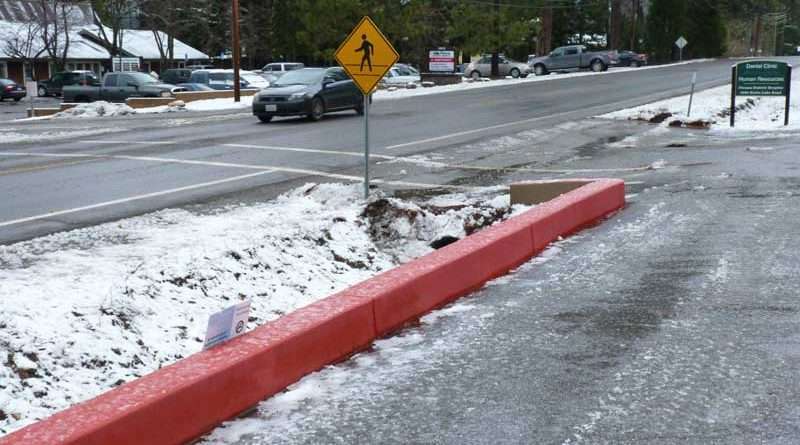 Drivers are racing past Plumas District Hospital at high speeds and the crosswalk in front of the hospital, being at a slight dip, is not easily seen in time for speeding motorists to react, according to the Plumas County Public Works Department. To make matters worse, people have been parking informally along Bucks Lake Road in front of the hospital, decreasing visibility near the crosswalks. Beatty has been working at the hospital for 15 years. In that time he has noticed that congestion has increased in front of the hospital. He said the hospital now has 200 employees and a large number of patients. More people are crossing Bucks Lake Road at the crosswalk to get to the hospital’s dental clinic and the human resources office on the other side of Bucks Lake Road from the hospital. The crew for Care Flight lives in a cabin across the road from the hospital, and they are always going back and forth to the emergency room, said Beatty. Beatty noted that there have been many close calls, including one instance where an employee almost got hit. Beatty has noticed that once people hit the outskirts of Quincy and stop seeing houses going up Bucks Lake Road, they just automatically think they are in the country and start speeding up. The informal parking in front of the hospital not only makes it harder to pick out pedestrians, it blocks a driver’s view of the hospital sign. Because of the parking, said Beatty, people from out of town can’t see the hospital sign even when they are specifically looking for it. And, according to Jim Graham, senior environmental planner with the Plumas County Public Works Department, the parking goes against county code which doesn’t allow parking along major roads where drivers have to back out into traffic. The cure in this case is to eliminate the informal parking along Bucks Lake Road in front of the hospital and to increase the visibility of the crosswalk, revealed Beatty. To this end, on Feb. 7 a crew from Public Works installed foundations for no parking signs along a 250-foot section of Bucks Lake Road in front of the hospital. The signs were erected on Feb. 13. To aid in visibility, PDH will purchase a pedestrian-activated flashing lights for the crossing to help drivers notice the crosswalk and pedestrians. The hospital installed a new hospital sign with LED lights to make the hospital sign more visible, which should also help. With all the people, congestion and ambulances coming and going from the hospital, Beatty thinks there should be speed zones around hospitals, like there are around schools. For the time being, however, the hospital and county are working together to make the situation safer. how about building a pedestrian bridge over the roadway? Hi, When I go to the hospital, as I leave Quincy the last speed limit sign is 25 mph, then shortly after a 30 mph sign and then nothing. How about another speed limit sign closer to the hospital? What is the speed limit at the hospital? Not to be petty, but shouldn’t the speed limit be part of the how, where, when, who, why part of an article about people speeding around the hospital and safety? Other than that a very good article – good job. or two and walk across when it is clear. Great ideas. But now we need a larger parking lot somewhere to make up for all the No Parking areas. The hospital’s main parking lot is always almost filled up during the daytime. I don’t know where more parking can go to, unless you buy more land across the street.